For a democratic secular Iran. For peace and prosperity in the Middle East. : Whats Going On? This propaganda war of who tortured their captives more, is getting more bizarre and stupid. When the Islamic Republic diplomat, Jalal sharafi, was first shown on Iranian state TV, he wore a suit, walked unaided towards Manouchehr Mottaki, Minister of Foreign Affairs, and they kissed and embraced each other. Mottaki kept squeezing him hard on the back without Sharafi complaining or giving any hints that he bears any scars on his back as a result of being whipped by cable during his captivity. 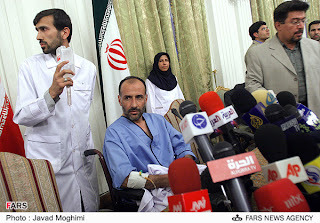 Now, he is paraded in front of the press, sitting in a wheel chair, in his hospital pyjamas, surrounded by "nurses" and connected to a drip. Sharafi then showed his torture scars, on his back and on his feet to the press. 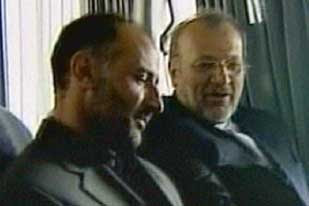 So the question is, what has happened to Sharafi since he has been released to Iran? Lol. Gotta keep up the charade. Looks like his injuries came from his buddies.